This investigation tested the construct validity of the first standardized assessment tool, the BaByVFSS Impairment Profile, (BaByVFSSImP©), developed for the quantification of swallowing observations made from videofluoroscopic swallow studies (VFSS) in bottle-fed babies. Construct validity of the measures was tested using descriptive methods and confirmatory factor analysis (CFA) of swallowing scores obtained from a cohort of bottle-fed babies (median age 3 months 1 day, interquartile range 1 month 4 days–7 months 4 days) sequentially referred for VFSS based on clinical signs, symptoms, or risk factors associated with dysphagia and/or aspiration. Main outcome measures were emergence of functional domains derived from swallowing component impairment scores. Confirmatory factor analysis resulted in 21 significant components (factor loadings ≥ 0.5) grouping into five functional domains labeled for common contribution to overall swallowing function. The tool was organized into the BaByVFSSImP. Clinical relevance was explored using correlational analyses between domain scores, maximum penetration/aspiration scores, feeding status, and caregiver burden. 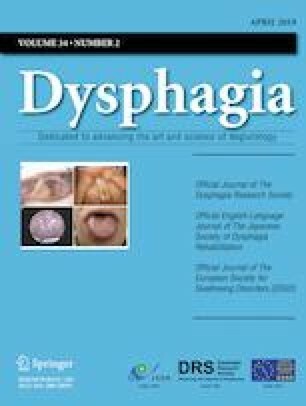 Quantification of physiologic swallowing impairment captured by BaByVFSSImP holds promise for identification of physiologically based targets for intervention, clinical decisions regarding enteral feeding, and tracking the trajectory of swallowing impairment throughout development in young children. The authors wish to thank the families for partaking in this project. Our gratitude is expressed for the contributions of the Speech Language Pathologists that were involved in this work including Kate Davidson, M.S., M. Cara Erskine, M. Ed., Jeannine Hoch, M.A., Sandra B. Martin, M.S., Heather Mcghee, M.S., Katlyn McGrattan, Ph.D., Keeley McKelvey, M.S., and Melissa Montiel, M.S. This work was supported by the National Institutes of Health Grants NIDCD 5R01DC011290-05 (ML-G and BM-H). The content is solely the responsibility of the authors and does not necessarily represent the official views of the National Institutes of Health. Norther Speech Services (NSS): Modified barium swallow impairment profile. https://www.mbsimp.com 2017.